Four America's Cup teams have jointly signed a statement expressing their "disappointment" after Italy's Luna Rossa team withdrew from the 2017 competition, urging Emirates Team New Zealand to "see a way forward, as we all have" and abide by the recent vote to move to smaller AC45 yachts. The decision was reached in a majority vote, which the Italian team called “illegitimate,” stating the rule change was “founded on an evident abuse of process". However, an official statement, signed by the four teams that welcomed in the rule change, explains that "taking these important decisions by a majority vote is something that was insisted upon by Luna Rossa and written into the rules of the event". Ben Ainslie of Britain’s BAR, Franck Cammas of Team France, Iain Percy of Sweden’s Artemis Racing, and Jimmy Spithill of Oracle Team USA have jointly signed a statement that clarifies all six teams agreed there was a need to change to a smaller boat to reduce costs, insisting majority rule was always agreed upon. Team New Zealand has not been shy in expressing its displeasure with the ruling, which not only set the stage for racing in smaller yachts, but also resulted in the withdrawal as Auckland as a host city for an America’s Cup Qualifier venue, “despite a signed and accepted bid”. The team has taken this to arbitration to fight for Auckland to remain as the qualifier venue. Last week, when America’s Cup organisers proposed to swap the agreed AC62s for smaller, cheaper AC45s, Luna Rossa and Emirates Team New Zealand “distinctly opposed” the move. They argued that any proposed rule changes should be unanimously accepted by all participating teams. Now it’s clear majority rule was always agreed. “While Luna Rossa supported a less dramatic change, a majority of teams agreed on what has become the America’s Cup Class, a new rule written in consultation with ALL teams, with drafts of the rule sent to ALL teams for comment and feedback”, the statement said. New Zealand has yet to offer an official statement. 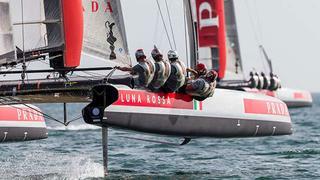 It has commented on the “sad day” for Luna Rossa’s departure, but it also continues to promote its team’s racing accolades. As Dalton explains, it’s already been agreed that Auckland will host a qualifier race and the paperwork has been signed. If the New Zealand capital loses the opportunity to host the challenger event, the government made it clear they wouldn’t support the team in their America’s Cup bid.